The next graph extends the short period shown in the previous section to five months, covering the transition from the summer, when wall and room are usually at about the same temperature, to the winter heating period. The first red vertical line indicates the period described in detail in the previous section. The second purple line marks a very cold period when a very large temperature gradient developed between the wall surface and the air in the church, even though the church was only heated to 12 degrees. It is quite clear from this analysis that porous walls are potentially very good at buffering against changes of relative humidity caused by temperature change but in most churches their performance is limited by their generally poor thermal resistance. 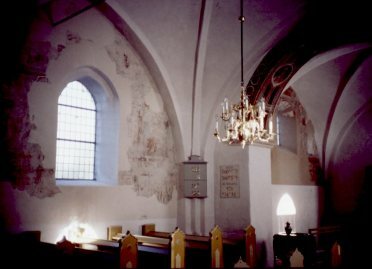 A comparison of the climate in the cup sealed against the wall with the climate in the church reveals the influence of ventilation; a much discussed aspect of climate control in historic churches. The arrows mark occasions when the church was ventilated by opening doors. The climate in the cup is only slowly influenced by the air exchange but the church reacts quickly. Ventilation in winter produces large RH excursions. One must ask why it is done. On the first occasion the church RH had risen over 80%. Maybe the custodian reacted too quickly because the weather changed as soon as he began to ventilate! On the second occasion there seems to have been no particular climatic reason to ventilate. The RH drop caused by ventilation is about as large as that caused by heating. A third cause of relative humidity instability is shown in the next picture. The sun shining on the wall below the picture generates a plume of hot air that rises past the wall painting. This rising warm air is rather a bad thing, because the high temperature gradient between air and wall increases the rate of accretion of dirt through the thermophoretic effect. This, put rather crudely, is the banging into the wall of small dust particles by warm, therefore energetic, air molecules. The air molecules coming from the direction of the wall are much more sluggish. The chaotic turbulent motion of the rising plume also bangs larger dirt particles into the wall because their inertia drives them on when the air stream swerves to avoid the wall. The patches of bright light are nice but the conscientious custodian will draw the curtains. There are at least two interesting discussions that arise from the measurements in Gundsømagle church. Why is the RH always higher than expected in winter? Humidity buffering cannot be the complete answer, because the moisture reserve in the wall would eventually be exhausted. There is an average excess water vapour concentration within the church over that outside, so there must be a continuous stream of moisture to the church interior. Other measurements suggested that rising damp through the floor and lower part of the walls is not sufficient to explain the observed RH. The other interesting matter is the apparently better climate where the wall is sheltered by a transparent cup. This suggests that the wall paintings could safely be enclosed by glass, with a huge reduction in the rate of accumulation of dirt, and a likely outcry from those who demand unrestricted visual access to a picture that only survives because it was protected by opaque whitewash for several centuries. These questions will be the subject for other articles.